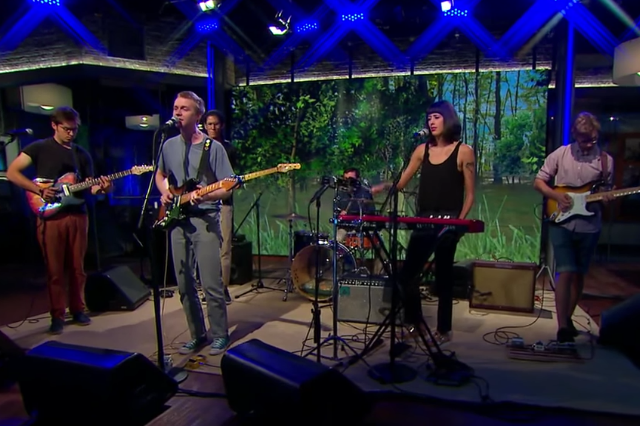 Performing "Cadmium," "Aphasia," and "Angelina"
Pinegrove made their national television debut today on Saturday’s CBS This Morning. The country-inflected New Jerseyans are wrapping up their publicity run for February’s Cardinal, one of SPIN’s best albums of 2016 so far. They performed two songs from Cardinal, “Cadmium” and “Aphasia,” as well as “Angelina” from 2015’s Everything So Far. Recent musical guests on CBS This Morning’s folksy (and surprisingly well-curated) Saturday Sessions include Lucy Dacus, Lydia Loveless, and Kurt Vile. Watch Pinegrove’s performance below. Pinegrove’s Skylight Is a Pretty Good Album, But Why Does It Exist?